Kyou wa karada no bubun no meishou wo benkyou shimasou. Mazu wa kao kara ne! 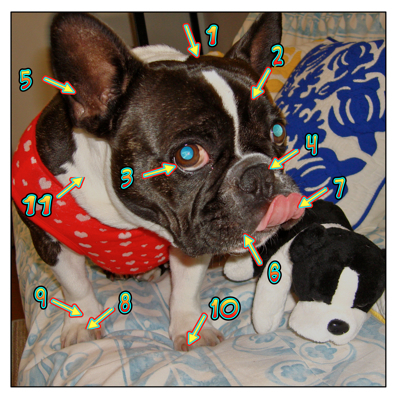 We’ll study the parts of the body today. First, let’s start from the facial area. = Mina oboemashitaka? Soredewa mou ikkai chekku wo shite mimashou! = Did you remember all of them? Then why don’t you test yourself? = Koko karawa chuukyuu no reberu desu. Jyouki no karada no meishou wo tsukatta hyougen no ichibu wo shoukai shimasu! 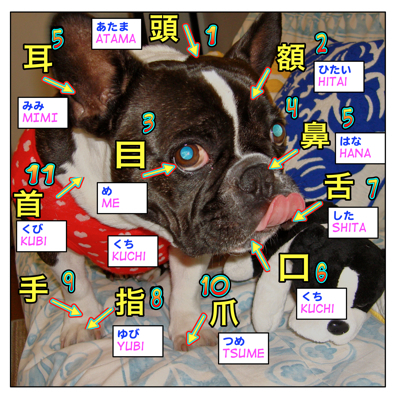 =The following lesson is for intermediate students.Here are some of the expressions using the above body parts names. = to plant flowers in the very small yard. = tsume no aka wo senjite nomu. = Anata mo kare no tsume no aka demo sennjite nondara dounano? = to be astounded — in a negative way — by someone’s behavior. = Nando mo onaji machigai wo surunante aita kuchi ga fusagarimasen. = I can’t believe you made the same mistakes over and over! = When you love little child (grandchild) so much. = Mago ga kawaikute me ni iretemo itakunai. = I just adore my grandchild! = Kinou shigoto wo kubi ni narimashita. = I got fired yesterday. = Karada no bubun no meishou wo tsukatta hyogen wa yama hodo arimasu. Korekara mo sukoshi zutsu shoukai shite ikimasune. Will I remember all of them? 猫の額ほど is usually used to describe a size of a land, (Ex. yard,garden) so we usually don’t use it for the size of your bed.